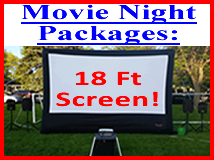 Our Large Outdoor Movie Night comes with an 18 foot screen. Each rental comes with a live attendant, who will be there the entire time to set up, play music and start the movie. Our Large Movie Night comes with high quality JBL speakers for quality sound, and a high quality full HD 1080P 3600 Lumens projector for superior image. We serve Denver and all of Colorado! Movie will start at sunset. Cannot start earlier than sunset.